Spotted in Mexico a man working from a crude suspended platform – or rather from alongside a platform. The platform is suspended from ropes circling the turret and simply tied onto the guardrails of the homemade platform. Getting it into position must have been something of a challenge? The working height appears to be around 10 metres or so. 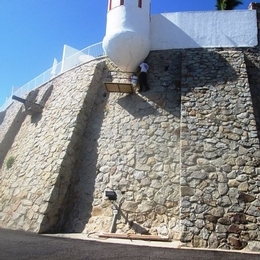 In order to reach part of the turret structure where it joins the wall, either to paint or fill, he has climbed out of the platform and is clinging to the wall like a rock climber. He has tied one of the ropes around his waist as a crude form of harness, but that might do him as much mischief as the fall if he should take a plunge. If he did fall it would certainly be a vacation memory for those watching which they might struggle to get out of their minds.